Women and children in fur parkas made from animals trapped and hunted on the land. Imarmiutaat tua-i cuignilnguut-llu, kanaqliit-llu atkuutullruut maani. Nunamiutaat imkut maqanruut. Kaviaret-llu, uliiret-llu maqartut atkukellrit. Mink, otter, and muskrat skins were used as parkas around here. Fur from land animals was warmer than other kinds of skin. Red-fox and white-fox skin parkas were warm. Uingekumta-gguq, ikgelengraan amilek atkuutuli, atauciungraan pegtevkenaku assirluku pikilaput. Atam-gguq tuaten piurqumta ilangurluni, kiituan-gguq atkugkanrurtuq, ayuqenrilngermeng, tamacenaungermeng. They said that when we got a husband, even if a few animals were caught that could be used as a parka, or even if it was just one, we were told to take good care of it and put it away and not just leave it out anywhere. They said that we'd eventually have enough to make a parka, even though they were different kinds of skins. 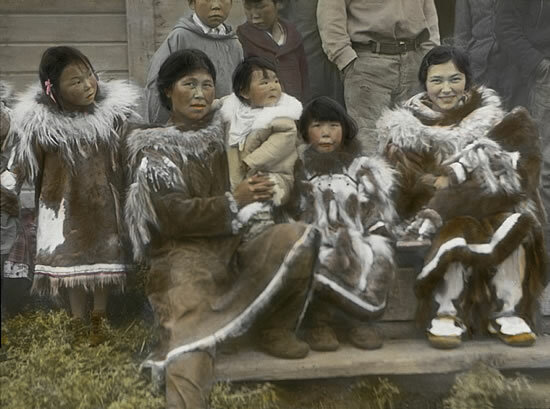 Women worked long and hard sewing animal pelts into warm and sturdy parkas, hats, boots, and pants to keep their families warm and dry. Men worked equally hard supplying their wives with skins to clothe their families, noting that it was shameful to let ones spouse lack material to work on. 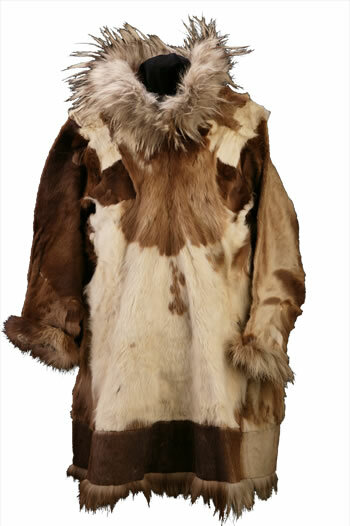 Man's hoodless caribou skin parka from the Yukon. Theresa Moses said: "Men's clothing, especially their hunting clothes, never fit snugly. We try to make the body large and the sleeve top large and heavy duty, thinking about when he will try to quickly put his arm through." 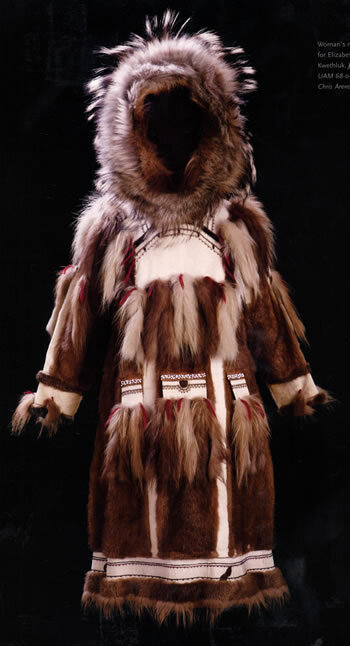 Qaliq/Mink parka made for Elizabeth Nicolai of Kwethluk. Paul John said, "She would make her daughter in law a parka using her own design, like transferring her design." When a young woman entered the qasgi wearing such a parka and carrying food to a young man, all understood them to be husband and wife. 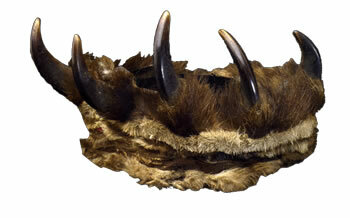 Bear Claw Head dress from Igushak, valued reminder of a successful hunt. Wassilie Evan recalled, "They say that brown bears have ears through the ground. When people talk aabout how dangerous they are, that bear would say, 'Ah, why do they say that we are dangerous, as if they aren't dangerous themselves.'" 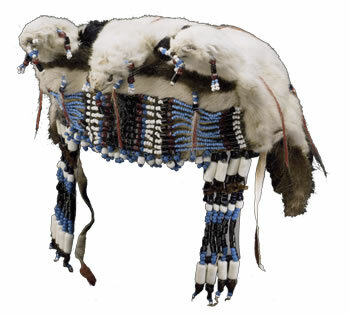 Ermine headdress from Bristol Bay. 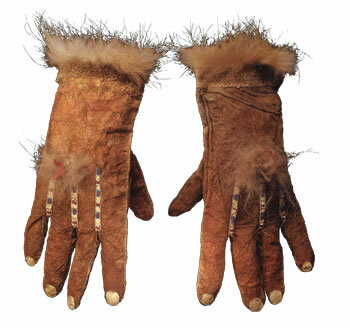 Caribou-skin dancing gloves from the lower Yukon River, embroidered with seal-throat-skin "fingernails." 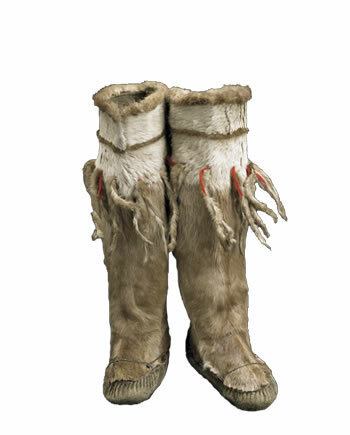 Boots made of caribou leg skins were sewn using the front of the caribou's back leg on the boot's front and the back of its front leg on the boot's back; this avoided the skin that was worn thin by the animal's habit of kneeling to forage. 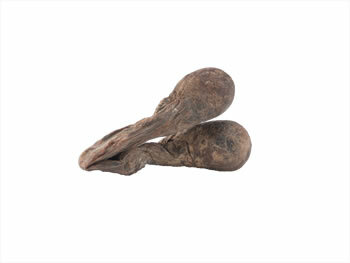 Beaver castor Timothy Myers recalled: "My grandmother used these beaver castors [scent glands] as medicine. The inner portion tasted like pitch from a tree, and they chewed them."